The experts who cracked Nazi Germany's secret codes are tackling a 10-letter enigma that has stumped fine minds for more than 250 years - D.O.U.O.S.V.A.V.V.M. Former code-breakers from Britain's World War II intelligence center at Bletchley Park set out this week to decipher a cryptic inscription on an 18th-century monument at an English country estate. Legend says it reveals the location of the Holy Grail. Some believe it is a private message to a deceased beloved. No one knows for sure. 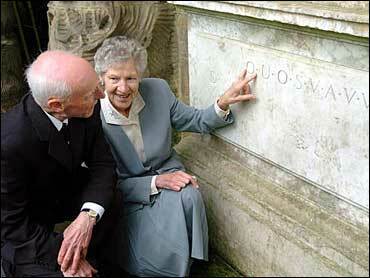 "The inscription is obviously a classical reference. It's either Latin or Greek and based on some historical happening," said mathematician Oliver Lawn, 85, a Bletchley Park veteran who is leading the quest along with his linguist wife, Sheila. The mystery is carved on a marble monument tucked away in the gardens of Shugborough House in central England, the ancestral home of photographer Lord Lichfield. Based on a painting by French artist Nicholas Poussin, but carved in reverse, the etching depicts three shepherds pointing at an inscription on a tomb that reads "Et in arcadia ego" ("And I am in Arcadia, too"). Below the image is a line of letters - O.U.O.S.V.A.V.V - and beneath that on either end, the letters D and M.
Lawn, who was recruited to Bletchley Park in 1940 while studying mathematics at Cambridge University, proclaimed himself puzzled. "The picture's a funny one," he said. "Why it's a mirror image is very strange." Some believe the monument holds the key to finding the Holy Grail, the cup Jesus Christ drank from at the Last Supper. The Anson family, who built the Shugborough estate in the 17th century, had a long-standing interest in the Knights Templar, a secretive medieval order who claimed to be guardians of the grail. Shugborough spokesman Russel Gethings said the carving made significant changes to Poussin's painting that could contain clues to the code. "They changed what one of the shepherds is pointing to," he said. "He's pointing to a completely different letter than in the painting. And they've added a second sarcophagus to the picture." Others think the letters are a private message from one person to another. The current Lord Lichfield's grandmother believed it stood for the opening letters of a line of verse: "Out of your own sweet vale Alicia vanish vanity 'twixt deity and man." "Inscriptions like this might be considered to be a family message, but there are no records within the family of what it means," said Gethings. Teams of mathematicians, linguists, crossword-puzzle aficionados and chess champions worked at Bletchley Park, northwest of London -- code-named Station X -- to crack Nazi secret codes during the war. Their greatest success was breaking the Enigma, the machine that produced codes used by the German navy to direct U-boat attacks on Allied convoys. The breakthrough was a major factor in the Allied victory and may have shortened the war. Christine Large, director of the Bletchley Park museum, said the monument's code was different from the mathematical ciphers used by the Nazis. "This looks to us as if it's probably going to need language expertise -- maybe skills in Greek and maybe forgotten languages -- as well as mathematics and puzzles," she said. The museum is encouraging visitors to take a stab at cracking the code, and to contribute any historical information that may prove helpful. "We have to keep an open mind about what kind of solution we're seeking here," Large said. "I think it's likely to be something more prosaic than the Holy Grail, but then most things are."